"Traditional Ethiopian vegetarian dish. I've cut down the amount of oil that is used in the dish and added some different spices to complement the collards." Place chopped collard greens in a pot with 2 cups of water. Bring to a boil, then reduce heat to low. Cover, and simmer until collards are tender, about 20 minutes. Drain, but reserve the cooking water. Set aside. Heat 1 tablespoon olive oil in a pot over medium heat. Stir in onions and cook until just beginning to brown, about 10 minutes. Stir in garlic and cook for 1 minute. Add the cooked collards, 1 tablespoon olive oil, and the reserved cooking water. Simmer, uncovered, over medium-high heat until liquid is nearly evaporated, 10 to 15 minutes. Add the green pepper slices, lemon juice, salt, turmeric, paprika, allspice, and ginger root. Cook until peppers are soft, about 5 minutes. A family recipe for stewed red cabbage with apples and apple cider vinegar. The spices in this were a little funky. Maybe I made it wrong. This recipe was delicious and healthy, though it didn't quite have the flavor that I expected. I added more ginger root and some hot sauce, and omitted the salt, and it was perfect. YUM! Easy to make, really good. 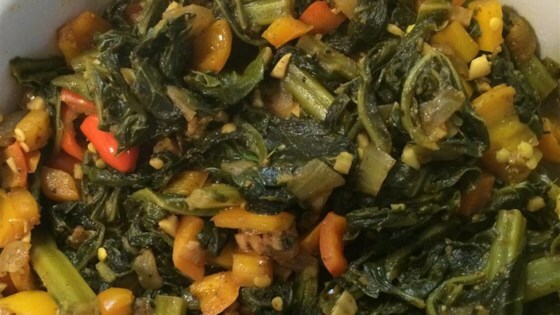 A good way to make collard greens healthy.